Gethu is boring and uneventful, warns S Saraswathi. 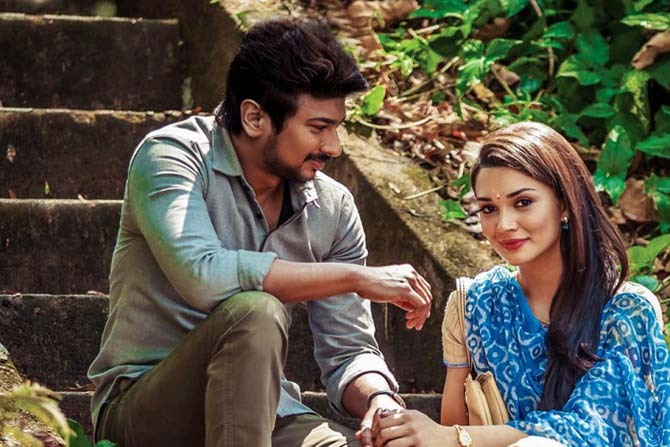 There is very little to hold your interest in director Thirukumaran’s Gethu, except stunning locales. Set in the backdrop of a beautiful hill station, the film is cinematographer Sukumar’s show all the way. Every frame has been brilliantly captured from innovative angles, be it the eerie misty nights, the mighty dam or the spectacular waterfalls. But the film is let down by the uninspiring screenplay and poor execution by the director, who gave us the super hit Maan Karate last year. It starts off promisingly enough, with a sniper assassin called Bull (Vikranth) being hired to kill a top Indian scientist. There are no exciting twists or edge-of-your seat moments in this ordinary thriller that seems too focused on its hero Sethu (Udhayanidhi). The producer-turned-actor has undergone a total makeover, not just his stylish new looks but his performance as well. There is none of the cockiness and meaningless chatter that we usually associate with the actor. He appears far more subdued as a sedate librarian caught up in a dangerous game. Sethu’s father Thulasi Raman (Sathyaraj) is a righteous physical education instructor at a local school, frequently getting into trouble for his relentless complaints against the miscreants of society. He is eventually accused of murder, when a bar owner he had previously entangled with is found dead. All the evidence is against Thulasi and it is up to Sethu to assist the incompetent police. The second half is all about how Sethu unravels this mystery and its connection to the clever Bull and his mission. Actor Karunakaran has replaced the ever-present Santhanam as Udhayanidhi’s friend and the duo share absolutely no chemistry. Sathyaraj gives a decent performance, but the much-hyped Vikranth as the antagonist falls far short of expectations. Despite the sophisticated characterisation and the dramatic background score that seems to pound every time Vikranth appears on the screen, the film is boring and uneventful. Amy Jackson, stripped off all her glamour, as a book thief named Nandhini Ramanujam, simply makes no sense. Even the song picturizations do little credit to this British beauty, who has been forced into a role that doesn’t suit her. This is definitely a new genre for Udhayanidhi, who has previously starred in only romantic comedies and the actor, who has also produced the film under the banner, Red Giant Movies, does show a lot of potential. Director Thirukumaran’s Gethu fails to live up to its interesting premise; the film is all show and no substance.